Australians, when we were growing up there, generally had a sense of being distant from the rest of the world and its problems. It felt a safe place to be. 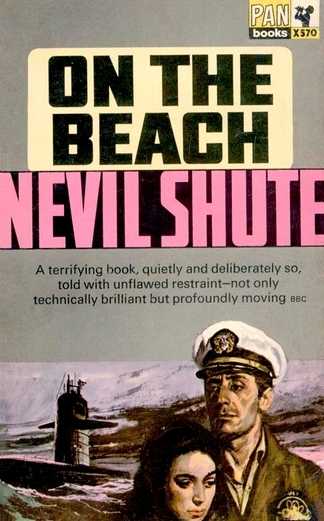 A famous post-apocalyptic novel ["On the Beach", Neville Shute] popular in the late fifties and later the basis for a Hollywood movie depicted a world ravaged by nuclear destruction - and Melbourne the last remaining somewhat-untouched (temporary) haven. Findings based on data collected in a major annual survey has found record levels of insecurity among Australians. Key points from the annual Lowy Institute for International Policy report, released today are that, first, they identify the lowest feeling of safety among Australians, and the sharpest decline in optimism about the nation’s economic performance in the world, in the 11-year history of the poll. A very significant majority (69%) sees Islamic State as a high risk to Australia's security. About the same proportion, 69%, supports Australia’s military participation in Iraq. But at the same time, Australians appear to understand how complex this process is, since only 20% think taking these steps will make their country safe from terrorism in the future. [I]n 2015... the world seems to be a bleak place to many Australians. Fewer Australians feel safe now that any any time during our 11-year polling history. Only 24% of Australian adults say they feel 'very safe' this year, 18 points down from the 42% who felt very safe when we last asked them in 2010. It appears the threat of terrorism is being keenly felt here, after the Martin Place siege late last year [we blogged about that in December 2014 and in January 2015] and the gruesome scenes and confronting news coming out of Iraq and Syria. [Most Australians] (69%) support Australia's participation in military action against Islamic State in Iraq (air strikes and training and support to Iraqi forces), even though a majority believe that such participation increases the risk of terrorism to Australia now, and only 20% say it makes us safer from terrorism in the future. 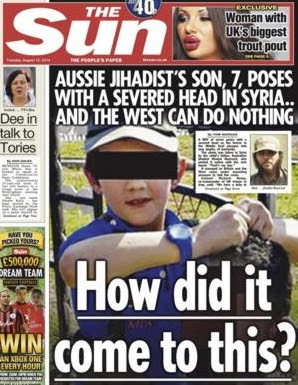 Inevitably (our view - not Lowy's) some part of the growing anxiety comes from Australians seeing their neighbours' children embracing Islamist values and moving heaven and earth to personally become part of the current Arab-on-Arab bloodbath convulsing vast swathes of the Middle East. You know, it's difficult for us to collect information from overseas and we have to rely either partner agencies or alternatively you know, what families feed us from their contact with their children who are now overseas so it is hard for us to quantify. I do suspect that there's more than 12 that have actually gone over to support other, you know, jihadi fighters within ISIS but we're not quite sure. Interviewer: And what is the lure? Well, I think there's a romanticised view for some young women and if I could press the point that the vast majority of the women that we know who have travelled are very young, you know, they're 18 to 20 years of age. And I think they're given some sort of romanticised view that, you know, they'll go over there and life will be really good for them, that they will be you know, put on a pedestal, that they're there to help create or help establish the caliphate over there, bear and raise jihadi children, that they'll be respected as women and that their lifestyle will be good. Addressing the problem within the home. Sounds to us like a serious basis for a different kind of approach.